“D’y think we’ve been walking for more than 15 minutes yet?” asks Jack, re-reading the scant directions in his hand. “More like 40 minutes” Sue and I agree. We’d been hiking steadily uphill through the forest and, according to the ‘map’, should have taken a right turn 25 minutes ago. “Compass!” Jack was like a surgeon calling for a scalpel. He laid the compass on the map in what, to my mind, was a series of indecipherable, coded movements. Directions have always been a mystery to me. Maps are a foreign country. I have no in-built compass or sense of direction whatsoever and could, were it not for the landmark of the house, get lost in my own back yard. “We’re on the wrong path” came the diagnosis, “we need to re-trace our steps and take a left turn”, the prescription. It was Sue’s second day and first hike with us. We’d been enthusing about this walk ever since she arrived; about the beauty of the Anagas, the difficulty of the terrain, the need to be properly prepared with adequate water supplies, good boots, a hat and of course experienced hiking companions who knew the lay of the land and the language of the forest. Sue and I had resolved to stop walking until satisfactory evidence that we were on the right path had been brought to our attention. Having hiked all the way back down the forest trail and taken the allegedly ‘correct’ path to the left, the trail had petered out and Jack had gone on ahead to see if it re-emerged further on. The ‘stairs’ turned out to be two boulders stepped into the gorse covered slope followed by a series of laddered indents in the sheer rock face of whatever else it was, was not a path. “Ha! A regular staircase!” said Sue, the sarcasm barely masking her fading confidence in her hiking guides. I wonder how many times in the history of the universe those words “trust me” have come back to haunt whoever uttered them. 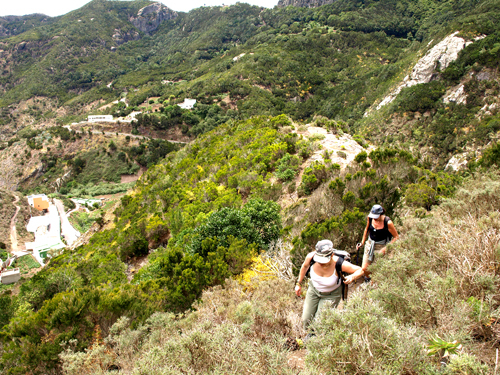 We climb the non-existent path for 15 or so sweaty, scratchy minutes, the views opening up around us to reveal a plunging barranco to our right and Tenerife’s equivalent of the north face of the Eiger to our left. “I really don’t think this is a path” says Sue, the red wheals beginning to raise around her ankles and calves. “Andy, do you think this is a path?” she asks, not unreasonably. “Er, this isn’t right.” Jack eventually concedes that, without the aid of crampons, ropes and harnesses, there’s no way through. However difficult the uphill trek was, going back down was worse. Sue and I inch our way over the dry dust and loose stones, grabbing handfuls of sharp gorse to steady us as we puff and grunt our way back down the ancient slope. “Okay, then it has to be this way” Jack’s boots raise a small cloud of dust as he heads off again in the direction of the barranco. Sue and I follow. Ten minutes later, we’re re-tracing our steps again, back up the slope towards what is now becoming a familiar crossroads of goat trails. A further attempt to reach the far side of the barranco is aborted before finally beginning a desultory return to where the so-called ‘stairs’ had first taken us in what was now indisputably known as the wrong direction and agreement was generally reached that we should have stayed on the original path up through the forest. Two hours had passed during which we were all pretty much exhausted and we hadn’t moved more than 500 metres away from our starting point of Chamorga. It now being 1.30 pm and far too late to begin the hike again, we head back to the little church plaza in Chamorga and eat our packed lunch in quiet contemplation; Sue admires the beautiful yellow butterfly that’s flitting through the bamboo…or is it sugar cane? Jack mutters to himself over the map and the words ‘typical’ and ‘mas o menos’ are heard repeatedly; I slip the compass out of the rucksack and into the pocket of my shorts; it seems to me that sometimes a little knowledge can be a dangerous thing. It’s 2.30pm on a hot Saturday afternoon and we’re sitting in a large shed at the bottom of someone’s garden in Tacaronte. Our party of 7½ (Bea is only 5 years old) are seated in front of the corner bar. To our right, a long trestle table seats 20 or more people, predominantly women. Above our heads long strings of bunting in the form of red squares with the words ‘Red Square’ written on (for those who have trouble identifying the obvious), hang from the rafters. Outside on the verandah two barbecues are being stoked up by Yayo and his wife while a dozen men stand around drinking beer, smoking and talking about the football. There’s a TV screen set at one end of the terrace, ready to show the Spain vs Sweden match which is due to kick-off at five. Jack and I are the ‘gringos’ in this gathering. Almost everyone else here is either a Peruvian immigrant or the offspring of Peruvian immigrants and the Spanish is fast, vowel curtailed and difficult to zone in on, but the faces are welcoming, the smiles are wide and the greetings are kisses. 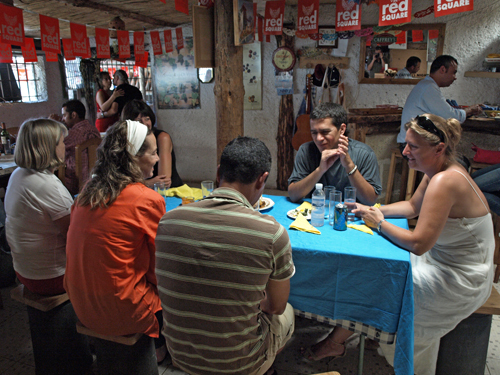 Previously running a Peruvian restaurant in the town, our host and hostess now hold this monthly, invitation only lunch for their friends in the shed at the bottom of the allotments behind their house. It’s an extremely informal affair where you help yourself to cutlery and if you ask for more bread you’re handed a loaf in a paper bag and a bread knife. While we drink our beers, a basket of bread is placed in the centre of the table next to a small dish of a bright orange coloured dip. I break a piece of the bread and ‘dip’. I eat the bread. She’s not wrong, very hot is indeed what it is, but delicious, and definitely moorish. I reach for another piece of bread and repeat the dose, explaining that we Brits actually have a palette for very hot food, curry being our nation’s favourite dish. Everyone thinks the quantity of dip that Jack and I are putting on our bread is hilarious and they clearly think we could implode at any moment. This is coming from a nation of Canarios, and it seems Peruvians, who if faced with a Madras would run screaming from the building. Having established our credentials as fire-eaters, we are systematically urged to try every dish that makes its way to our table and told ingredients and basic cooking instructions for each. First comes the ceviche; raw fish, celery and onions marinated in lemon juice and fresh coriander creating a sharp, aromatic succulence to the fish. Then comes a corn cake filled with goats cheese and a pastry covered swiss chard pie which tastes similar to Greek ‘spanakopitta’ but without the feta. When the big, fat, ‘papas rellenas’ arrive, we’re encouraged to add some of the dip to them to spice up the savoury meat and sultana centres for our British taste buds. Then, while our glasses are being replenished, a large plate of barbecued spare ribs arrives to round off the main courses. Amidst much excitement and building expectation, the postres (puddings) arrive. For our neighbour Marlene, these are clearly the highlight of the meal and she enthuses about the ‘mousse chantilly’, a soft sponge topped with light, fluffy, nutty vanilla mousse. But Jack and I prefer the chocolate brownies; rich, moist and cinnamon flavoured topped in a dark chocolate sauce, and the lemon pie; a light, tangy lemon meringue on a butterscotch biscuit base…probably the best pudding in the world. The heat inside the shed is rising as the sun shines mercilessly outside (a fairly unusual phenomenon for Tacaronte) and many of the women have brought beautiful hand fans which are creating a gentle series of drafts that move the air. The chatter is loud and plates and glasses are being passed around and re-filled as the afternoon passes blissfully by. It’s almost five o’clock when the bill arrives and we pay over our €14 (£11) each and head home to the lure of a siesta. Many Canarian families have very close ties with Latin America, their forefathers having fled the poverty of the Canaries to the promise of the New World whenever the economy faltered. As a result, there’s a little piece of most South American countries alive and well in the hidden corners of the north of Tenerife. As far as Peru is concerned, that corner is a garden shed in Tacaronte. The Tinerfeños are an incredibly easy going bunch of people. Other than when they’re behind the wheel of a car, they appear in no particular hurry to do anything and are quite happy to watch visitors (particularly those from a northern European country beginning with the letter G who are known for their penchant for queue jumping) make arses of themselves by jostling for position at every venue that requires waiting for service. It’s one of the endearing features of Canarios and long may it remain so…unless they’re waiting to be served at the bar of JC Murphy’s when The Robert Cray Band is about to take to the stage and I happen to be standing behind them. This weekend was the opening of the annual Blues Festival in Santa Cruz, ‘Santa Blues’; a FREE festival financed by the City, and The Robert Cray Band were headlining the night on a stage below the iconic 18th Century tower of Iglesia de la Concepción at the start of the trendy Noria District of the city. I arrived just before 10pm for a scheduled 10.30pm start which I was fairly sure would fit the usual pattern of Tenerife timekeeping and kick off somewhere around 11/11.30pm. Having spotted a nice little gap underneath the tulip tree within touching distance of the left side of the stage, I set off to find the beer tent. There were already a couple of hundred people milling and chatting around the venue, plastic beakers of beer in hand. As I made my way through them I noticed how ‘cool’ they were; here was long hair, dreadlocks, tattooed feet, hippies old and young, Boho chicks and students. Laid back styles, laughing eyes and languid hips belonging to people who were behaving as if they were at an open air party amongst friends. The warm night air carried the unmistakeable scent of good grass and I felt myself relaxing and smiling as I headed around the corner in search of a beer. After much confused wandering and a failed attempt to get to the backstage beer tents, I finally discovered that the beer was being dispensed from inside JC Murphy’s and joined the queue for the bar. Unfortunately, the man I was standing behind was being resolutely Canarian and letting any number of people push in before him so I moved to the other side of the bar where a couple of lads appeared to be ordering drinks for the entire festival. By the time I got served and headed back to the stage area, the band was already on stage and had begun their opening number; clearly no-one had briefed them on the ‘mañana’ culture; not the first time such an oversight has occurred on this island. Amazingly, my little spot by the side was still there and I had an uninterrupted view throughout the set which included ‘Poor Johnny’, ‘I’m Walking’ and ‘Twenty’ from the album ‘Twenty’; ’12 Year Old Boy’ and ‘Phone Booth’ from the album ‘Live – from across the pond’ and the classic ‘Right Next Door’ and ‘Smoking Gun’ from the early ‘Strong Persuader’ album. 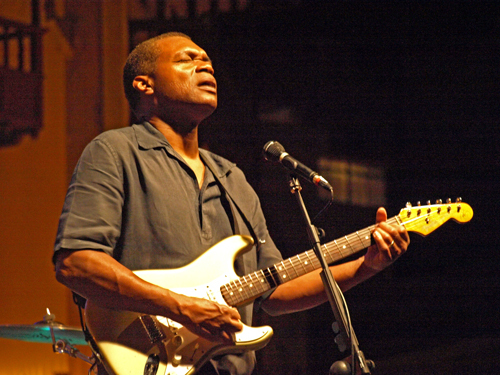 Robert Cray’s voice was as strong as ever and his fretwork had the audience in raptures. Although looking like someone’s dad and doing a distinctly ‘dad dance’ to the Memphis rhythms, the keyboard player Jim Pugh provided sublime backing while Karl Sevareide kept a funky bass riding the air waves. Ironically, although they clearly loved the set, the audiences here on Tenerife seem unaware of the need to ‘persuade’ the band to do an encore and my hands were sore by the time I’d illustrated the practice hard enough for those around me to take up the chant. But they soon cottoned on and shouts of “¡Otre!” (literally ‘again’) brought the band back for a three number encore ending with ‘Time Makes Two’. In that intimate setting amongst those cool people, I had to keep reminding myself that it was real; that I really was watching these Blues legends from my formative years, live in Santa Cruz on a Friday night and I was just feet from the front of the stage. No jostling, no crowding, no idiots, just great Blues.